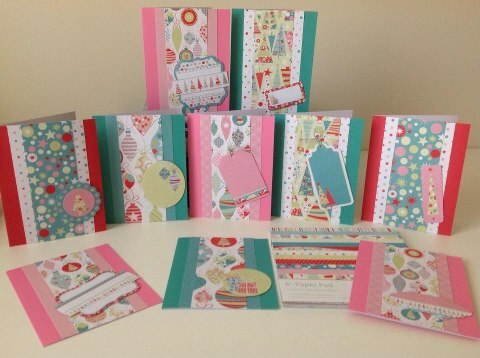 I am all in favour of a day dedicated to my most favourite craft – card making! My challenge for the day, apart from the heat (a lovely 36C in Brisbane, Australia), was to use Kaisercraft Christmas Carnival 6″ Paper Pad to create a set of 10 christmas cards for a friend of my mum’s. I am sorry to say, that this is last years design so you may or may not be able to buy it. I luckily discovered a few months ago a Kaisercraft outlet only 15 minutes from me tucked away in a quiet location just near a large hardware store. The bargains were truly fantastic with most items 90% off plus gift bags for shopping there. Needless to say all of my crafty friends received a gift bag from me of Kaisercraft products. But I digress, all of these cards were made from the Kaisercraft paper pad (with the exception of a few inches of silver crochet thread). Modern, funky and full of the joy of the upcoming festive season. The best part is that I still have enough left over to make another 15 or so cards. So, even if you aren’t a card maker or into scrapbooking, have a look for one of these “all-in-one” paper packs and see what you can create. Hope you have had a productive World Card Making Day!